Are you stuck in middle management hell? A generation of workers can't get ahead - because aging boomers above them won't budge. Here's how to break through the gray ceiling. 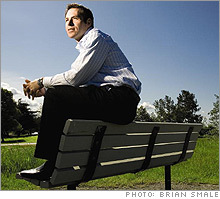 (Fortune Magazine) -- Jon Ciampi had always thought of himself as a rising star. A portfolio analyst for Wells Fargo in San Francisco, he had a solid job at a big company, pulled down an enviable salary, and scored top marks on his performance reviews. Are boomers holding you back? Tell us what you think. Sure, he was stuck doing some grunt work, and, yeah, working till after midnight wasn't unusual. But he was only 29! He was doing everything his bosses asked him to! How long could it be before he'd be running the place? Jon Ciampi, 33, VP of Marketing, SumTotal Systems, Mountain View, Calif. His take: "If you want to get a bigger job, you have to go where the growth is." 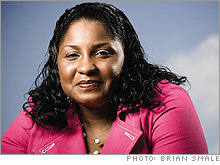 Ngina Mclean, 31, Systems Engineering Manager, Lockheed Martin, Greenbelt, MD. Her take: If you find an employer that puts an "emphasis on learning," stay put. Kurt Knackstedt, 34, Senior Director, Worldwide Travel, Cendant, London. His take: Pull up stakes for an overseas job - and convince your employer that this "isn't just a notch in your belt." 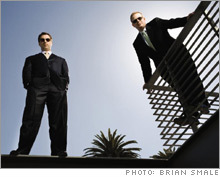 Ryan Bristol and Brett Voris, founders of PropPoint.com, Santa Monica. Their take: Ditch the corporate ladder entirely and "get away from all the corporate politics," says Voris. Anne Fisher helps you navigate the workplace with timely advice every week on fortune.com. How long can I wait to tell the boss I'm pregnant? Then he started doing the math. The head of his division was 50, easily a decade or more away from retirement. The six managers who reported to the division head were all in their mid-40s and had settled into their jobs for the long haul. Below them was Ciampi's boss: an ambitious thirtysomething MBA who, even by Ciampi's standards, put in incredible hours. But even though he and his boss were killing themselves, neither seemed to be on a promotion track. There was simply nowhere to promote them to. Then came the final straw: Wells Fargo (Charts) installed another fifty-something at his boss's level, who, Ciampi says, didn't know a thing about the business. "It really ticked me off," he says. "I realized I'm not going to move up until the people above me do." How long would it be before Ciampi's star actually rose? "It looked like it was going to be never," he says. He was far from alone. At Bank of America (Charts), Ryan Bristol, 30, was spinning his wheels. Though his boss praised his work for the company's private-banking group, it drove Bristol nuts that every move he made still had to be signed off on by an army of superiors. "The people above me were all ages 45 to 65 and weren't about to leave. It was clear to me I wouldn't get promoted no matter how good I was." On Madison Avenue, Brett Voris was similarly demoralized. As an account manager at TBWA\Chiat\Day, he and the other thirty-something's were coming up with the best ideas, and they were the ones fielding late-night client emergencies. Yet they had zero authority to make decisions on their own. "In advertising - and I saw this at more than one agency - youthfulness is valued because it's seen as with-it and relevant, but it's a paradox," he says. "The senior managers in their 40s and 50s are paranoid about keeping their own jobs, so they do everything they can to keep you down." The same goes for the media business. One 36-year-old finance manager at a broadcasting company got her last promotion four years ago. "Since then, I've just been stuck, and so has everyone else my age," she says. The next level up is vice president, and the six current VPs aren't retiring. "I'm under so much pressure here, but the rewards just aren't coming," she says. "I have to get out." Twenty-, thirty-, and even forty-something managers are in trouble. Fifteen-hour days have become the norm. Un tethering oneself from one's BlackBerry is, in many fields, considered high treason. And weekends? Those are for catching up on e-mail, right? All this might not be so terrible if that big promotion - the one that catapults an up-and-comer out of middle-management hell and into the senior ranks - were around the corner. But increasingly, younger workers are finding that no matter how many hours they put in or how much their bosses rave about their work, they're just plain stuck. An entire generation is bumping against something no amount of youthful vigor can match. Call it the Gray Ceiling. The Gray Ceiling is purely a function of mathematics. Jon Ciampi, for example, was born in 1973, when the birthrate hit a quarter-century low. Just ahead of him and his peers is the anomaly known as the baby boom, the 77 million Americans born between 1946 and 1964. Just behind him are the boomers' children, known as Gen Y, who form a second bulge. And sandwiched in between is the baby bust, or Generation X. Known variously as the laziest generation and the most entrepreneurial, they are unambiguously the smallest generation since the Great Depression. Though that worked to the benefit of Gen Xers when it came to slots in elite schools - and will once again work to their benefit when the boomers finally leave the workforce - right now it's holding them back. For starters, the workplace makeup has changed dramatically from just a decade ago. In 1996 there were 64 million U.S. workers between the ages of 30 and 39 and only 43 million ages 40 to 59. Now the situation has reversed. As of June 2006 there were only 40 million ages 30 to 39 and 69 million workers 40 to 59, according to the Bureau of Labor Statistics. Nobody is suggesting that all boomers have it easy. For one thing, as Fortune reported last year in "50 and Fired," those tossed out the door in the latest recession are having a tough time getting back in. That problem and the Gray Ceiling - a term that has been associated with age discrimination in the past but is taking on a new meaning - share a common cause: In today's leaner companies, executive jobs are fewer, and boomers who have hung on to them are in no hurry to let go. When Korn/Ferry surveyed 2,000 senior-level managers at global companies recently, they found that 44% said they plan to keep working past 64. Consider the legal profession: In 1998 associates took an average of seven years to make partner, according to Vault.com's annual survey of 19,000 attorneys. By 2003 the average was 8� years. Now it's 9�. "The reason is simple" says Vault.com co-president Sam Hamadeh. "Partners aren't retiring." Generation X, it would seem, is in danger of turning into the Prince Charles of the American workforce: perpetual heirs apparent awaiting the keys to the kingdom. "I'm not ever planning to retire," says Janelle Shubert, a professor of management at Babson College in Wellesley, Mass., who is turning 60 this October. "My little joke is, 'I'll try not to die in the classroom because it might upset the students.' "
Shubert is also the associate director for Babson's Center for Women's Business Leadership, and in that capacity she does wonder how the boomer logjam will affect younger generations. "The glass ceiling is being replaced by a Gray Ceiling of baby-boomers," she says. "Those of us who've spent decades paying our dues are finally reaping the rewards, both psychological and financial, and we don't see any reason to step aside now." Result: "We're now the ceiling that our young colleagues are going to have to break through." What's so wrong with that, boomers might ask? Quite a bit, actually, at least for companies that are thinking long term. Bosses who aren't focused on how to keep Gen Xers happy will inevitably find that somebody else is. So much for the "future of the firm." Unlike the glass ceiling and other forms of discrimination, the Gray Ceiling has no obvious legal or legislative remedy. You cannot sue boomers for being too numerous. But during interviews with several dozen managers, Fortune zeroed in on companies that are making a sustained effort to fast-track the careers of Gen Xers, as well as half-a-dozen strategies that employees can use to crack through the Gray Ceiling on their own. "You'll never get ahead just by being really good at what you already do," says Michelle Peluso, who is now the CEO of Travelocity. "Top management will look at you and say, 'Hmmm, okay, just keep doing it.' " Peluso, Ciampi, Bristol, Voris, and others all managed to get out from under the ceiling, and what they've learned can help anyone who feels trapped. Demography, it turns out, isn't destiny. In a gray-walled conference room in Ridgefield, Conn., 26 employees of Boehringer Ingleheim, a German pharmaceutical firm, are sitting through a new type of diversity training. They're about evenly divided between boomers and Gen Xers, and the moderator, Yael Sivi of the FutureWork Institute, has asked for a list of adjectives that describe the younger set. Sivi bravely tries to turn the discussion in a more productive direction. "Let's say you're a Gen X manager, and you think your boss is totally incompetent," she says. "Are you going to respect him or her just based on a title alone? No. Is this different from your parents and grandparents? Yes." She looks around the room. "Anybody here who was a latchkey kid growing up?" A 30-ish man in khakis and a green polo shirt raises his hand. "Okay, latchkey kid, what was your life like? What did you do when you came home from school?" He replies that he hung around the house waiting for his parents to come home from work. "So you structured your own time," says Sivi. "Doing your homework, maybe making yourself a snack? Maybe you even started dinner?" She gestures to the group. "Fast-forward 20 years. How does this guy want to be managed? He doesn't want to be micromanaged. Hands off! Because he's been managing himself since he was 10 or 12 years old." The fact that the Gray Ceiling even exists is news to many boomers, says Margaret Regan, who runs the FutureWork Institute and works with clients that include American Express (Charts), Citibank (Charts), PepsiCo (Charts), Pfizer (Charts), and Kraft Foods (Charts). Gen Xers "don't talk to their boomer bosses about it," she says. "Instead, they just quit." Even boomers who have hit the acceptance stage aren't exactly eager to publicize it. Says one HR chief, who asked to remain nameless: "Admitting to outsiders that you have lots of boomers taking up all the great senior jobs is like hanging out a sign that says, DON'T COME TO WORK HERE. YOU'LL NEVER GET PROMOTED." Or if you do get a promotion, it might not mean anything. Title inflation, Xers say, is a strange new outgrowth of this era. For this story, Fortune asked Korn/Ferry International to poll its executive network. Among Gen Xers ages 30 to 42, the findings were telling. More than half (51%) have been given a fancier title in the past two years. Yet almost half of those (47%) say they're still doing the same job. New job titles ranged from Chief Spiritual Officer to Process Change Manager to - our personal favorite - General Manager Reporting to the General Manager. The addition of the word "special" or "specialist" to a title is particularly in vogue. "The title Special Projects Specialist," wrote one executive, "actually means, 'Keep the person in the fridge.'" Gen Xers, whose career expectations were shaped during the '90s boom, are not, however, a patient bunch. That's why more and more employers are adopting "unsiloing" as their newest HR buzzword. Following the lead of GE, UPS, Exxon Mobil, and others, more companies are rotating young talent throughout the organization: A Sibson Consulting survey shows that more than half of Fortune 500 companies say they've begun shuffling potential leaders around to give them broad experience. Some companies have gone even further. Several years ago an internal Lockheed Martin survey showed that 70% of its workers were boomers or older. So the company began a four-pronged Gen X retention drive. They developed a program to rotate promising employees (about 800 at a time) through six functions over two years. High-potential young managers now get to tackle a new challenge at least once every three years. Lockheed made its tuition-reimbursement program so generous that many employees have earned multiple degrees on the company's tab. And the company made every boomer manager take on a Gen Xer to mentor and help with working out a career plan. It's working. Since 2001 annual turnover has averaged 2.5% - far below the norm in the industries where the company competes. "Recruiters try to woo you by offering you more money, but it's really about a combination of things this company does, especially the emphasis on learning," says Ngina McLean, a 31-year-old systems engineering manager in Greenbelt, Md. "It's the only place I've worked where I can see spending my whole career." Of course, developing younger workers is expensive, and what if they leave anyway? Many companies just choose not to do it, as Gen Xers trapped under the Gray Ceiling well know. In that case the only way through the Gray Ceiling is to bust through it yourself. "My father was a loyal corporate soldier who worked at the same company for 32 years," says Ryan Bristol. "But my generation is more interested in opportunities for fast growth than in security." On the day we're talking, he's speaking from his airy, glass-and-brushed-aluminum office building near the beach in Santa Monica. Oh, and his new title is CEO. It's a far cry from his old gig toiling for Bank of America. The fastest way out from under the Gray Ceiling, he realized, was to ditch the corporate ladder entirely. He met Brett Voris, the refugee from TBWA\Chiat\Day, in the MBA program at UCLA's Anderson School, and earlier this year they started PropPoint, a real estate investment firm. Their first investor was an acquaintance of Bristol's - they met at a Little League game where Bristol was coaching. He in turn brought in a friend who runs a venture capital fund. "It's great to get away from all the corporate politics," says Voris, even if "mistakes don't get absorbed, the way they do when you work for a big company." Perhaps the easiest thing has been finding talented young hires: One of their first employees is a 26-year-old financial whiz from Bank of America who had also hit the Gray Ceiling there. Not everybody has the stomach for a startup. Even so, sometimes opportunity is lurking much closer than you imagine. A few years ago, Denise Prince was just one of many thirtysomething senior vice presidents at Geisinger Health System in Pennsylvania. She thought Geisinger's state-of-the-art system for electronic record-keeping of patient data could radically change the way new drugs are developed and tested. She also saw a market for a new kind of quick, convenient medical care for minor injuries that could be delivered by nurse practitioners working out of retail stores. "I had a lot of informal contact with our CEO, and I gradually talked him into letting me do it," she says. With her boss's blessing, she started a new venture capital unit called Geisinger Ventures and has so far launched two businesses, with several more on the drawing board. Prince, 43, is Geisinger Ventures' CEO. Another strategy is to find a really big mess. "If you really want to move up, you have to get out of your comfort zone," says Michelle Peluso, 34, from her office near Dallas, where the roaming gnome from Travelocity's TV commercials looks down on her desk from a high shelf. A dot-com vet whose Site59 was acquired by Travelocity in 2002, Peluso joined the company but was eager to expand her role from senior vice president of product strategy. So she dug into the hotel-booking business, which "was such a big mess that no one else wanted to touch it." First she found out what hoteliers hated about the way travel sites were run. Then she built a new, hotel-friendly system to address their gripes. "Think about what keeps your boss awake at night. Is there something you can do to help?" she says. Her strategy worked so well that she got promoted to chief operating officer within a year, and then to CEO. "When I'm deciding whom to promote, I look for people who see the company as if they were wearing my hat," Peluso says. It may not sound strategic, but other Gen Xers have found that the route to the top sometimes heads, well, sideways. In 2003, Kurt Knackstedt, now 34, was working for a Philadelphia travel-services provider. In casual chats with people at Cendant, Knackstedt learned that the company wanted to hire someone to move to Hong Kong and pull together a scattered collection of Asian marketing efforts and new-product launches. He recommended himself for the job. Cendant hired him with his old title - "a lateral move in that sense," he says - but with a staff three times bigger and a budget five times the size. From there, it took Knackstedt just under two years to be promoted to his present job as senior director of corporate travel services worldwide, based at Cendant's headquarters in London. If you're jockeying for a job overseas, Knackstedt and others say it helps enormously to be willing to go as a so-called local hire. Rather than ask for a contract that guarantees you can come home in, say, two years, be ready to pull up stakes and assume you'll be living abroad indefinitely. The open-ended approach can help persuade higher-ups that "this isn't just a notch in your belt," says Knackstedt. Finally, being brutally honest about your industry is vital too. 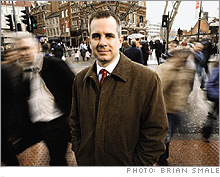 Remember Jon Ciampi, the guy who was trapped under a veritable boomer army at Wells Fargo? Once he decided to start job hunting, he quickly realized he was looking in the wrong industry. He had to make a leap. Ciampi had just enough computer experience to get hired by Oracle, and now he works for SumTotal Systems, which makes online-learning software for clients including Microsoft and American Airlines. Although he's had to scramble to develop new skills (he once took Harvard Business School's online course on new-product launches "two days before we were going to market"), he has scored four promotions and is now SumTotal's vice president of marketing. "If you want to get a bigger job," he says, "you have to go where the growth is." Each of these strategies - be it jumping into a different industry or a foreign market or starting a new venture - takes an appetite for risk. But here's what many people forget: Staying put in a going-nowhere job may be an even bigger gamble. Think about it. Before long, Gen Xers will be competing for promotions with a whole new batch of fresh faces - 70 million of them, in fact. Generation Y, after all, is growing up fast. Kate Bonamici, Doris Burke and Christopher Tkaczyk contributed to this article.